These are like new! Hope the pictures help. Patricia Green Black Driving Loafers, Size 9.5 M. Nice! Patricia Green Black Driving Loafers, Size 9.5 M. Gently Cushioned Signature Insoles. Smooth Leather Lining. Rubber Outsoles. Made in Brazil. New in box Size 6 A classic penny loafer handcrafted of the finest leathers. Well textured leather extends the vintage sophistication of a classic penny loafer. Well cushioned insole and great comfort. Perfect travel shoe! Slip into comfort with the Claudia from Patricia Green. 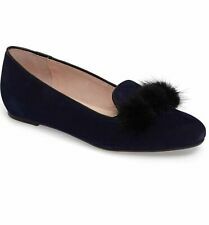 Featuring soft suede upper with a leather cuff at the topline, this loafer wraps the foot in leather lining and supports with a manmade sole with grippy cut treads. This is one shoe that will work year-round in your wardrobe collection. Style: Loafers. Material: Suede. Size: US 7, EU 37. Color: Black. Patricia Green. Size 11 USA. Local pick up is available in the Fort Lauderdale FL area. Cash – If you pick up the item. Patricia Green's Classic Penny Loafer features a classic and simple design, making it a year-round outfit finisher. - Squared toe - Penny slot strap - Slip-on - Lightly padded footbed - Imported. Leather upper, manmade sole. Length (heel to toe)- 10". Bottoms of shoes are slightly dirty. Insoles of shoes show light wear/dirt. Outsides of the shoes are in good condition. Width- 3.25". Patricia Green Brown Suede Flats Made In Spain Size EUR 40 Excellent Condition! Patricia Green - Suede Flats - Brown Color- Size EUR 40. 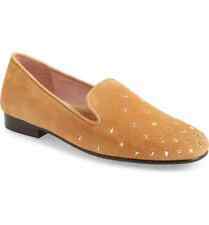 - Pointy toe - Loafer style - Slip-on. Bottom soles are dirty. Insoles and inner lining has light scuffs from use. Length (Heel to Toe-Outer soles): 10.25". Length (Insoles):10". Width: 3.25". Womens Horsebit Navy Blue Leather Loafers Shoes Flats Mocs By Patricia Green Size 7.5 Nearly MINT preowned condition - please see all photos. A sophisticated suede loafer adorned with a polished silver buckle. The Patricia Green size conversion says 36 is a US size 5. Suede and Rubber. There is a bit of wear along the bottoms towards the back. Toes are scuffed. Good condition! Patricia Green Soft Leather Flats. Condition: Excellent condition,but there is a light scratch on the back heel of the left shoe. See the last picture. Material: Leather. If you need it sooner choose Priority International. Length (Heel To Toe): 10.5". Shoes look practically new! Bottom soles are slightly dusty, no wear to treads. Faint scuffing on toes and back heels causing light fade marks. Insoles are clean. Shoes are in excellent condition. patricia green 8 Shoes. Shipped with USPS Priority Mail.So springtime color :) lovely shoes and very comfortable! Becca Hidden Wedge Tie Moc. Patricia Green. Sole: Rubber 100% Authentic. New in Box. Shoes are pre-owned and show light wear. Insole:9.5". Luxurious lambsuede slide loafer with horsebit buckle and fully leather lined. PATRICIA GREEN Stephie Loafer TIE MOC Tangerine Orange 39.5 9 NIB. Condition is New with box. Shipped with USPS Priority Mail. Made in Spain. Normally priced over $125, this is a steal. Sorry, no returns unless Friday misrepresented. Thanks and enjoy! PATRICIA GREEN womens size 37 red suede flats With Buckle Detail. Condition is Pre-owned. Shipped with USPS Priority Mail. Patricia Green Orange Chain Loafers Size 9. Condition is Pre-owned. Shipped with USPS Priority Mail. Leather and genuine mink fur (Spain) upper/leather lining/rubber sole. Our goal is to get your item on its way as fast as possible so you can have it fast as possible. Made in Italy, Italian Soft textured faux python leather with metallic toe tip. Patricia Green Niki Side Buckle Moc. Patricia Green Collection. Color: Coral. Size: 7 USA 37 EU. Super cute, very comfy shoes! Last pair in this color. Blue is sold. NEW IN BOX. Color:Tan/Silver Condition Description:Creasing on Uppers/Scuffing on Bottoms Bottoms Rating:Light Wear Insoles Rating:Light Wear Uppers Rating:Light Wear .